The Lakeport Plantation house is an Arkansas State University Heritage Site. Built for Lycurgus and Lydia Johnson in 1859, the Greek Revival home is one of Arkansas’ premiere historic structures and is now the only remaining antebellum plantation home in Arkansas on the Mississippi River. The Johnson family retained ownership of the house until 1927, when the Chicot County plantation was purchased by Sam Epstein. The house was added to the National Register in 1974 and was gifted to Arkansas State University in 2001 by the Sam Epstein Angel Family. Following a massive restoration effort, the home opened to the public on September 28, 2007. The ca. 1860 floor cloth was one of the most exciting finds during Lakeport’s restoration. 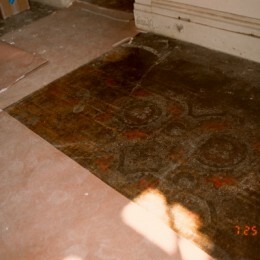 The wall to wall (15’ x 9” x 26’ 2”) floor cloth (or oil cloth) was rediscovered in the entry room during restoration, having been previously documented by the Arkansas Historic Preservation Program in the 1970s. Canvas floor cloths were often painted to give them the look of carpet, but with increased durability. The floral and medallion composition of the design conforms to known woven carpet patterns of the period. Negative image of Lakeport entry threshold shows some of the dealer’s label. The worn dealer’s label has always been a source of frustration. The fact that it read Louisville, KY is interesting, because the Johnson’s are from Kentucky and other materials for the house are also coming from that area–Wallace & Lithgow Stove, as well as the mantels (Madison, Indiana). But we have always wanted to know who “Hi[? ]” was. 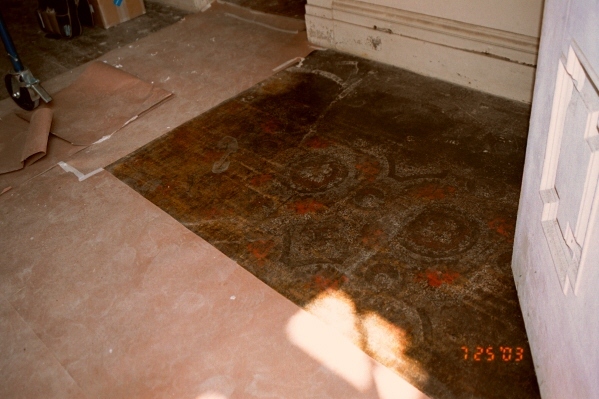 Well, thanks to a little bit of historical research, we can, with some certainty, say that the importer of the floor cloth was the firm of “Hite & Small” in Louisiville, KY.
From the entry floor we can make out the “Fr[om] … Hi[? ]…Louisville, Ky”. From knowing that, we looked in the 1859 Hawes’ Kentucky State Gazetteer and Business Directory on microfilm and found “Hite & Small” under “Hi”. 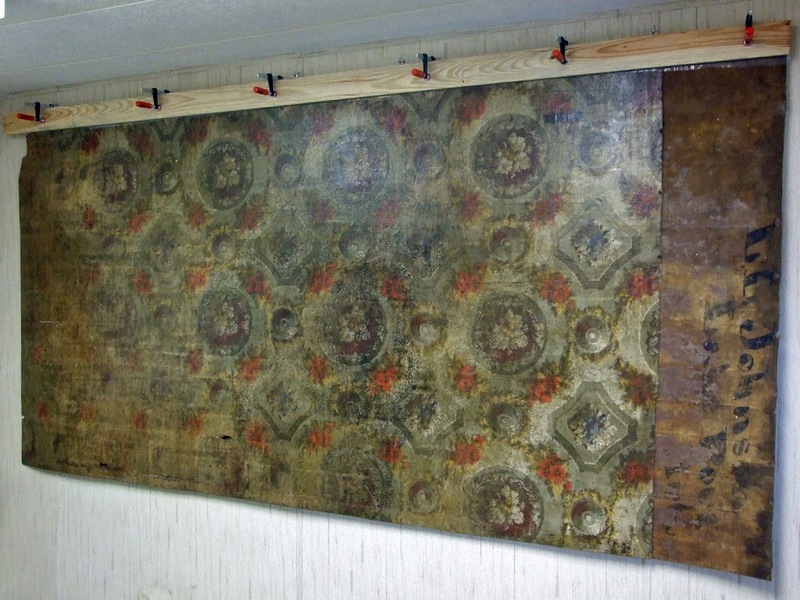 Since they are importers, the floor cloth could very well be made somewhere else [There were floor cloth makers in Kentucky in the mid-19th century]. Hite seems to show up in the 1860 Census as a 37 year old, Engineer born in Ireland with $800 real estate, $200 personal estate. (not so sure about it though). While, Small is a 45 year old, Kentucky born Merchant worth $40,000 real estate, $30,000 personal estate. 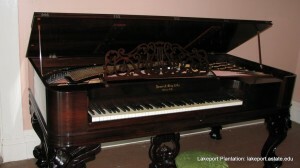 Lakeport’s original piano, a ca. 1869 J.A. Gray square grand and centerpiece of entertaining during the post-war era, returned to the house on the evening of June 14th. The piano was donated back to Lakeport by the Epstein-Angel family after spending roughly the last 60 years in storage at the Epstein Cotton Gin in Lake Village. Bradshaw Piano Services of Conway, Arkansas restored the piano. The piano first shows up on the Johnson’s county taxes in 1870. Before that date, there likely was no piano in the house. As the Johnson’s moved into the house in 1860, they were still decorating, until the war interrupted their plans. 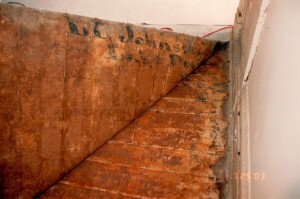 We know much of the interior paintwork was not complete by the start of the War; it is also likely that the Johnsons were not able to completely furnish the home until after the war. Tom DeBlack has noted, the Johnsons began to get their financial feet back around 1870 making Lycurgus again “leading planter” in Chicot County. As the piano was added to the taxable property, so was a gold watch and a pleasure carriage (DeBlack 2002: 32). The 1500 lb piano was likely left in the house in 1917, when Victor Johnson and his family moved to Greenville, Mississippi. There it stayed until the fall of 1950, when Alvin Ford and his family moved into the home. It was then moved to the Epstein Gin and put in storage. When Lakeport received the piano, it had been sitting on its side for 60 years; rodents had chewed on some of the wood; the legs were detached with some damage; the piano’s lid was completely split; strings were broken, and the piano’s rosewood finish was unrecognizable. 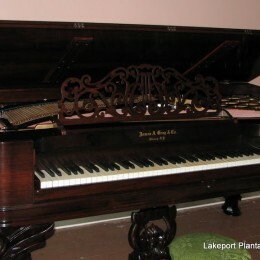 Bradshaw Piano Services of Conway was selected to do a museum quality restoration of the piano. Barry and Phyllis Bradshaw have over 75 years of combined work in the piano restoration and quality control. Bradshaw Piano disassembled the piano, replaced missing rosewood veneer, cleaned and re-plated hardware, repaired damaged legs, restrung the piano, replaced blue steel tuning pins…(the list goes on)..,and restored the rosewood finish (matching the faux rosewood doors in the home). We are excited to have the piano back at Lakeport. It is beautifully restored and again a centerpiece in the home. We hope you come out to see it. P.S. Our next event will be Barry Bradshaw talking about restoring the piano. Time and Date still to be determined.